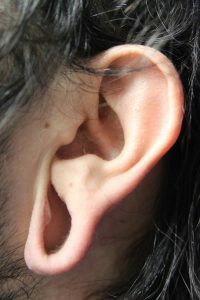 No matter what the reason is for seeking plastic surgery to close one’s gauged earlobes, the procedure to do so can be a relatively easy one for you. That is, it can be performed under local anesthesia in an office with “immediate” results and virtually no downtime or discomfort. 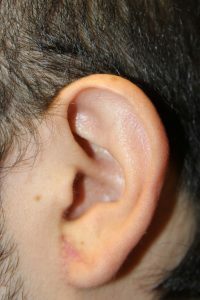 Though the ultimate appearance of your earlobes is affected by several factors including your own unique anatomy, the maximal gauge size, the rapidity of obtaining maximal stretch, length of time the gauges were worn and how long they have not been worn, it is ultimately the skill and experience of the surgeon performing the procedure that will allow you to obtain the best possible results. 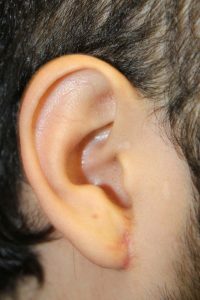 It is strongly recommended that you seek closure of your gauged earlobes from a reputable board certified plastic surgeon who has a lot of experience treating this issue and whose results (from photos or other patients) you find to be pleasing. 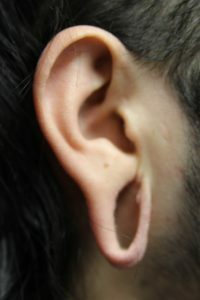 The photos below are representative results of plastic surgical repair of gauged earlobes which, in this patient of mine, were very stretched out. Though full maturation of the scar and results can take up to a year to occur (true for all types of surgery), even at two months postoperative here the scars are already becoming fairly inconspicuous. If you would like to schedule a consultation for treating your gauged earlobes or for any other plastic surgery procedure that I perform, please call my office at 480-451-3000.